Each carousel is made of fiberglass reinforced plastics(FRP), equipped with gorgeous lights, great music, non-fading and durable painting. Coin operated. 1. There are many different styles available for choice. When riding on it,kids will be moved up and down uniformly as well as spinning. 2. 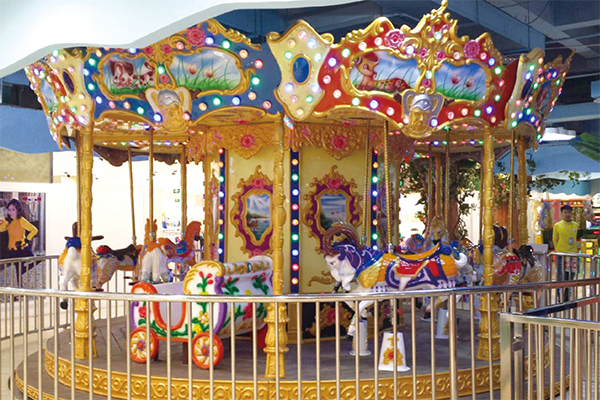 Carousels are very suitable for indoor playgrounds, kindergarten, shopping malls, residential community, grocery stores etc. 3. The whole designs are in updated cartoon figures and colorful painting make kiddie play merrily and enjoy great family life. 4. All of our equipments can be customized surely,not only in different color but also various models.